Over the years, people used what they had to clean chimneys. They didn’t have the modern brushes, vacuums or tools we now have. The old Irish chimney sweeps used a live goose to clean a chimney. They tied a rope around his neck and tossed him down the chimney. (Chimneys back then were much larger than they are today!) The goose flew back up the chimney knocking the soot off the walls of the chimney. By the time he got to the top of the chimney, he was fairly soot-covered. Peg suggested our company name. 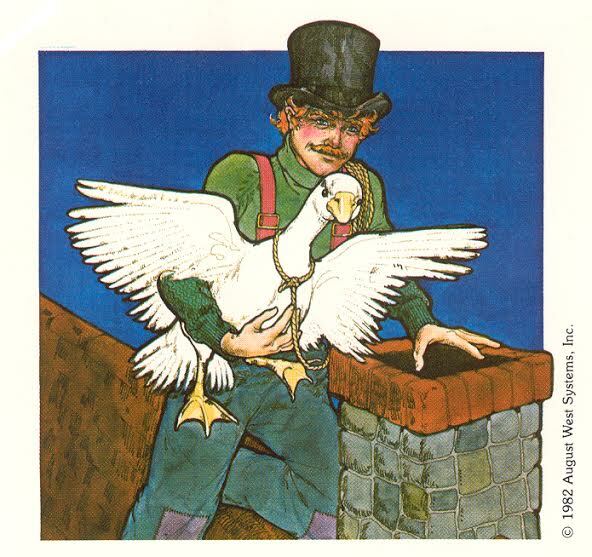 We saw an old poster showing an Irish chimney sweep holding a goose. After we had been in business for a few years, we were told by an old Hungarian lady that when she was a youngster, they used a “very durable” goose wing for a hearth broom! That durability has helped us. We have served the Twin Ports, Ne MN and NW WI since 1984! Synergy is the concept that when we all work together, the end result is greater than if each of us works independently. There is a great deal to be learned from the teamwork shown in ­­Lessons From the Geese. As each goose flaps its wings, it creates an “uplift” for the next bird. Flying in a ‘V’, the whole flock adds 71% more flying range than if each bird flew alone. Lesson: People who share a common direction and sense of community can get where they are going quicker and easier because they are traveling on the ‘thrust’ of one another. Whenever a goose falls out of formation, it suddenly feels the drag and resistance of flying alone. It quickly gets back into formation to take advantage of the ‘lifting’ power of the bird immediately in front. When the lead goose gets tired, it rotates back into the formation and another goose flies up to the point position. Lesson: It pays to take turns doing the harder tasks and share leadership. People, as with geese, are interdependent with each other. Lesson: We need to make sure our ‘honking’ is encouraging, not something less helpful. When a goose is sick, wounded, or shot down, two geese drop out of formation to follow him down to help and protect him. They stay with him until he is either able to fly again or dies. Then they launch out on their own with another formation or catch up with their flock. Lesson: If we have as much sense as the geese we will stand together.